Well what a way to kickstart our Image of the Month competition for 2019! The first winner of the year goes to Mary McIntyre, who observed a section of the Moon's surface with the Liverpool Telescope and then recreated the observation using pastel pencils on black paper - marvellous! We're enthusiastic about getting creative ideas like this onto the website, so if a creative thought pops into your head, be sure to share it with us in the Share Your Images Forum. 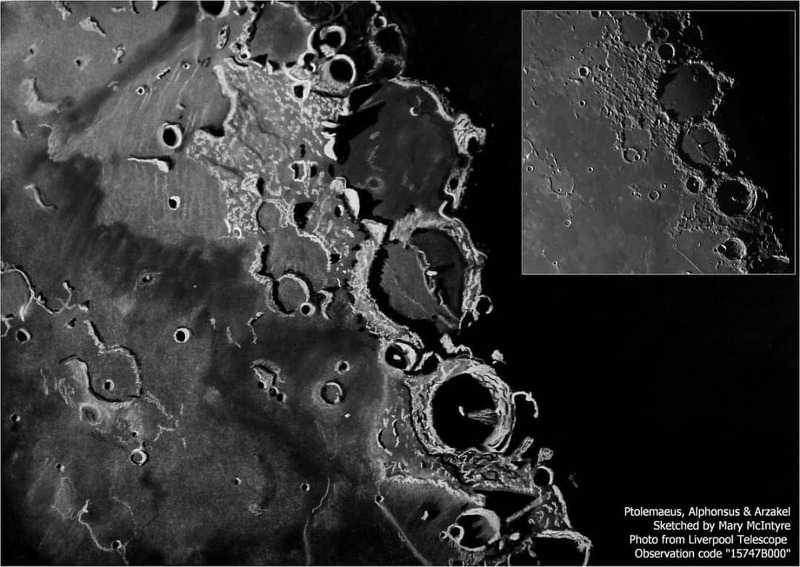 The three craters in the center of the image in a vertical line are Ptolomaeus (top), Alphonsus (middle) and Arzakel (bottom). The crater Ptolomaeus is named after the Greek astronomer, astrologer, mathematician and geographer Claudius Ptolemy, born in 100 A.D. Just shy of two thousand years ago, Ptolemy wrote a treatise (a formal written work of a subject) on the astronomy and mathematics of the paths of stars and planets. It also serves as a record for the lost written works of the astronomer and mathematician Hipparchus, 190 - 120 BC, who is believed to be the founder of trigonometry. A great portion of Ptolemy's work was based on Hipparchus' findings.